It's an important day for the U.S. economy and global financial markets. The U.S. Bureau of Labor Statistics reported better-than-expected job growth last month, which is influencing market sentiment around the world. 1. The jobs report is out! : The October jobs report shows the U.S. economy created 271,000 positions in October, beating expectations for 181,000 new jobs. The unemployment rate declined slightly to 5%, a modest improvement from September's 5.1% level. The economy is considered healthy when it's creating at least 200,000 jobs per month. However, investors aren't thrilled with the numbers since they worry that a stronger economy will mean the end of cheap money. Many are expecting the U.S. Federal Reserve could now raise interest rates in December. 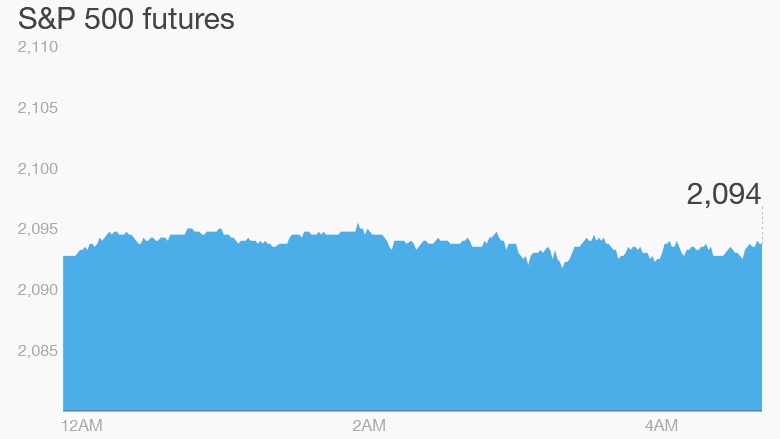 U.S. stock futures are dipping ahead of the opening bell and yields on U.S. government bonds are jumping. 2. Premarket movers: Shares in miner BHP Billiton (BHP) are declining by about 5% premarket after a dam at one of its Brazilian mines broke and flooded a nearby village. Many fatalities have been reported, but the company said "we still don't know the full extent of the situation." Menswear firm Jos. A. Bank reported poor sales and a bleak profit outlook on Thursday, which has caused shares in parent company Men's Wearhouse (MW) to plunge by roughly 30% in extended trading. Shares in TripAdvisor (TRIP) are falling around 10% premarket as investors react to disappointing earnings. Shares in Monster Beverage (MNST) are rising by about 8% premarket as investors cheer better-than-expected quarterly results. 3. Takata trouble: Shares in the troubled auto parts manufacturer Takata dropped another 6% in Japan as more large automakers say they will stop using the company's airbags. The value of the stock has halved since the start of the year as the company has struggled to respond to a deadly airbag scandal. 4. Losses in luxury: Shares in major European luxury brands are taking a hit Friday after Richemont (CFRUY) announced weak sales in the past month and disappointing performance in Asia. It also said the head of its Cartier brand had left the company. Shares in Richemont dropped 8%. Shares in LVMH (LVMHF) and Swatch Group (SWGAY) followed with falls of about 5% as investors worried about weakness in the industry. 5. Earnings: Humana (HUM) and Cigna (CI) are due to report results before the open. Warren Buffett's Berkshire Hathaway (BRKA) is reporting after the close.